Oxford University Press, USA, 9780199395408, 272pp. When films like The Jazz Singer started to integrate synchronized music, in the late 1920s many ambitious songwriting pioneers of the Great White Way - George and Ira Gershwin, Cole Porter, Richard Rodgers, and Lorenz Hart, among many others - were enticed westward by Hollywood studios' promises of national exposure and top dollar success. But what happened when writers native to the business of Broadway ran into the very different business of Hollywood? Their movies had their producer despots, their stacking of writing teams on a single project, their use of five or six songs per story where Broadway fit in a dozen, and it seemed as if everyone in Hollywood was uncomfortable with characters bursting into song on the street, in your living room, or in "a cottage small by a waterfall." Did the movies give theater writers a chance to expand their art, or did mass marketing ruin the musical's quintessential charm? Is it possible to trace the history of the musical through both stage and screen manifestations, or did Broadway and Hollywood give rise to two wholly irreconcilable art forms? And, finally, did any New York writer or writing team create a film musical as enthralling and timeless as their work for the stage? 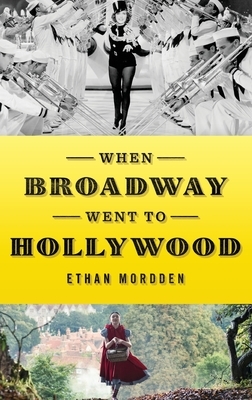 In When Broadway Went to Hollywood, writer and celebrated steward of musical theatre Ethan Mordden directs his unmistakable wit and whimsy to these challenging questions and more, charting the volatile and galvanizing influence of Broadway on Hollywood (and vice versa) throughout the twentieth century. Along the way, he takes us behind the scenes of the great Hollywood musicals you've seen and loved (The Wizard of Oz, Gigi, The Sound of Music, Chicago, West Side Story, The Music Man, Grease) as well as some of the outrageous flops you probably haven't. The first book to tell the story of how Broadway affected the Hollywood musical, When Broadway Goes to Hollywood is sure to thrill theatre buffs and movie lovers alike. Ethan Mordden is a recognized expert on the American musical theatre and the author of Anything Goes: A History of American Musical Theatre, Make Believe: The Broadway Musical in the 1920s, Beautiful Mornin: The Broadway Musical in the 1940s, Coming Up Roses: The Broadway Musical in the 1950s and Sondheim: An Opinionated Guide, all published by Oxford University Press. His writing has been featured in The Wall Street Journal, The New York Times and The New Yorker, and his numerous books include friendly introductions to opera and film as well as five collections of short stories chronicling gay life in New York City. He lives in Manhattan.